The Paradise Fund is a grass-roots movement, carried throughout the country by a dedicated and ambitious group of students and young professionals. Beginning with the creation of the Paradise Ball, an event aimed at bringing together the new generation of young professionals in support of children suffering from illness, ravaged by war or living on the streets of our local community, The Paradise Fund’s goal has been to gather the community in order to educate our generation of the ongoing political, environmental, and social problems being faced by people around the world today. 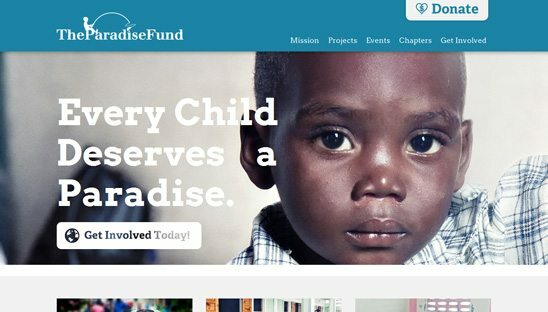 It was fun to design a wordpress theme for a non profit organization. We went with a clean design and good use of large images for the top of every page. Site also has a custom events page to display all their current and future events. Easy to navigate wordpress site and prominent donate button.